So what’s the message? Believe in yourself, in your abilities, in your strengths and in your dreams. It’s important for a product owner to be the owner of his own self before he starts owning any product or any vision. 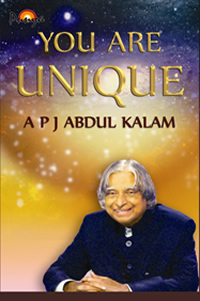 While Dr. Kalam express this as a message from spirituality, honesty, being unselfish and the value of giving emerges from these pages as from his life, I add to this another dimension of being in self control, valuing yourself and having trust in your skills. The Mantra of “You are Unique” is to be recited each time you are in a state of low confidence. This act as an morale booster to restore confidence in yourself and your abilities. This also helps in avoiding any unwanted/ unnecessary comparisons that you we often get subjected to at work place. “You are Unique” will help you establish your identity and long lasting mark that many will envy for many years. Since my days at high school, I have always believed that every human is born with a unique purpose and it is up to each one of us to identify and serve that one purpose which is the reason of our existence. While you continue to search for the purpose of your life, keep yourself motivated, keep saying “You are Unique”.